Birds' instinctive yearning to fly is thwarted when they are confined to a cage. Even in a large aviary, it is virtually impossible to provide birds in captivity with a natural existence, since naturally changing temperatures, food, vegetation, and landscape cannot be recreated indoors, nor, of course, can the birds fly freely. As a result of the horrific travelling conditions they are forced to endure, many birds captured in the wild die long before arriving at their destination. Because birds seem so very different from us, we can easily overlook their intelligence, abilities and emotions, as well as their sense of fun. In fact, birds are highly intelligent. Crows use tools like twigs to pick up food. Some even make her own tools. Crows are known to use cars to crack open walnuts - the birds wait until cars stop at road junctions then place the nuts in the road, knowing that when the lights turn to green, the cars will roll over the nuts and crack them open. When the lights turn red again, the crows hop back into the road to eat the nuts. Birds remember exactly where they've hidden thousands of seeds each autumn and find their way back to their stashes using the sun, stars, landmarks, and the magnetic pull of the earth to guide them. Crows have about 300 different calls but not all crows understand each other. Just like us, they have different accents. Crows in the United States don't understand some calls that their British cousins make, and vice versa. Birds make sounds that we don't usually hear, like the hushed chatter and whispering between two nesting crows. They take turns 'talking,' in the bird equivalent of a conversation. Birds grieve and take care of one another. After a car killed the mate of a coucal (a member of the cuckoo family), he refused to leave her side or stop trying to revive her. A robin that crippled his rival in a fight was seen feeding him and keeping him alive. Another witness watched as a pair of terns helped lift an injured member of the flock by his wings and carry him to safety. Birds dance, play 'hide-and-seek', and have even been seen sliding down snowy slopes then climbing back up to do it over and over again for the sheer joy of it - just as we do! Yet thousands of birds are still taken away from their families and flocks every year, packed up as if they were plastic dolls, and sold at bird shows or through pet shops. Many don't survive the journey, and those who do are likely to be destined for a life of misery. 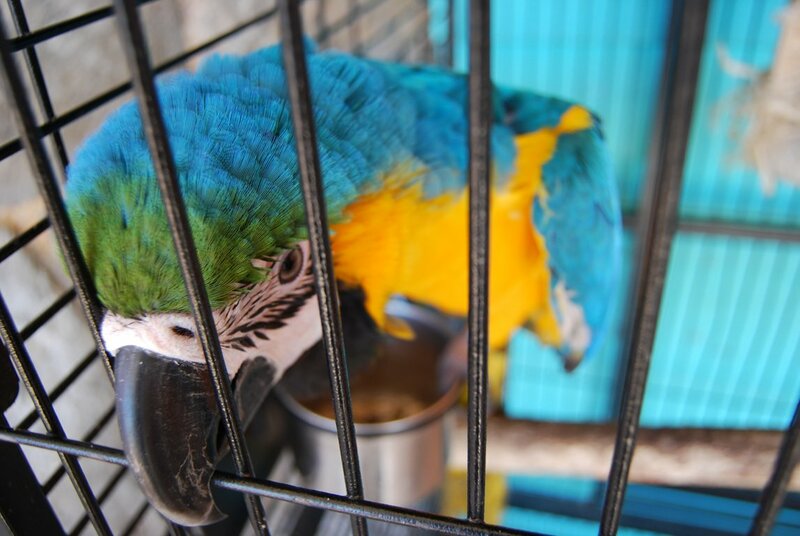 For people who have aviaries or who have the space for pairs or groups of birds to fly indoors, adoption from sanctuaries, rather than buying birds from shops or breeders, is recommended by animal campaigners.